Venezuela is today facing great danger of war, chaos and destruction, with the active participation of the US, the EU and Colombia. These countries have economic interests and use a sector of the Venezuelan opposition to make believe that a “parallel government” exists. In fact, their strongest bet has always been coup d’état. Let’s remember a few things. After winning a majority in the December 2015 legislative elections, the Venezuelan right wing defended a “Law of Amnesty and National Reconciliation”. The objective was not to free so-called “political prisoners”, but rather the people mainly responsible for the 2014 coup operation known as “La Salida”. A certain sector of the Venezuelan opposition took part in the dialogue table without dialogue ever being their intention. This led to misunderstanding on the part of international mediators, such as former Spanish President Rodríguez Zapatero. Already in 2017, after their failed attempt to provoke a coup amidst violent street actions, the opposition announced their “parallel government” plan. Fatal illusion. Trump wants to destroy ALBA, a system in which cooperation based on human needs takes precedence over the law of the wild market. Venezuela, Cuba and Nicaragua are obstacles to the US ‘manifest destiny’. Did Trump forget the historic lesson that Fidel and Sandino gave to the US troops in their frustrated attempts at invasion? After meeting with the Trump government, the Colombian president insisted that he is actively working to “liberate the Venezuelan people” and that the “diplomatic encirclement” will lead to a “domino effect. Has he forgotten that millions of Venezuelans have regained their dignity since the Fifth Republic was established after a referendum for a Constituent Assembly? As in the attempted coup d’état against Chávez in 2002, the Spanish right wing is on the front line of ending democracy by preparing the ground for an infamous US war. This was the purpose of the failed visit of a European Union parlamentary group and the planned meeting between their delegation and Guaidó. The president of a major French television channel once admitted that his job was to “sell available brain time” between two advertising blocks of a well-known beverage brand. These same media will not tell you that over the last month there have been several important marches in favor of the Bolivarian Revolution. But it’s not just a media war, it’s also a culture war. Once again, history helps us to understand the present. During the Cold War, Marshall Plan funds were allocated to “cultural” propaganda in Western Europe, with the aim of erasing the memory of the Resistance fighters in their respective countries. The United States has a master’s degree in this field, and has never neglected the impact of art and culture to help justify its military interventions. 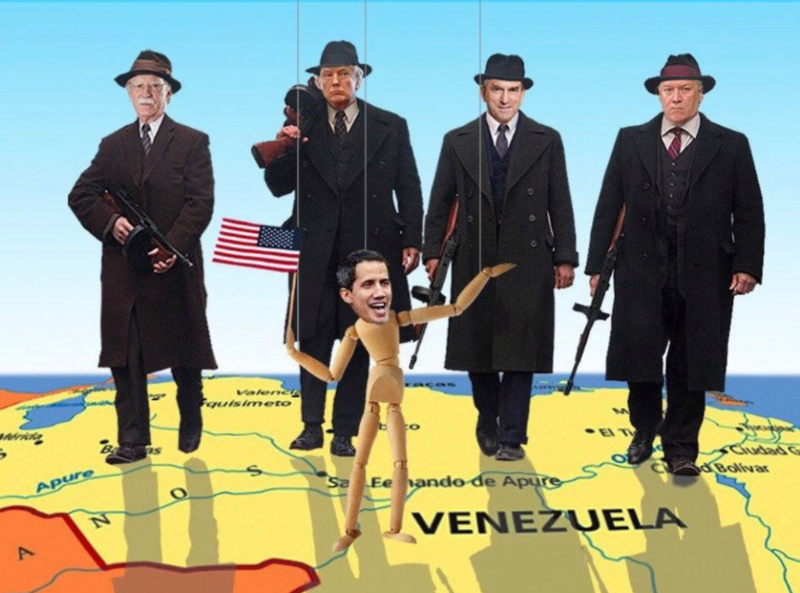 Thus, on February 22, Trump’s government decided to organize a big concert, mobilizing musicians and political personalities for the cause of the so-called “humanitarian aid” the US would like to send to Venezuela against that country’s wishes. Some might think maybe a concert is a good thing after all? Venezuela has the largest oil reserves in the world. One thing explains another. Former FBI director Andrew McCabe has reproduced in his book “Inside the Threat” the content of a 2017 Oval Office meeting: “Then the President spoke about Venezuela. It is with this country that we must go to war,” he said. “They have all this oil and they are no further away than our backyard”. Alex Anfruns is a lecturer, journalist in Brussels. In 2007 he helped direct the documentary “Palestina, la verdad asediada. Voces por la paz” (available with Catalan, Spanish, English and Arabic subtitles). Between 2009 and 2014 he made several trips to Egypt and the occupied Palestinian territories. He has edited the monthly Journal de Notre Amérique since 2015.